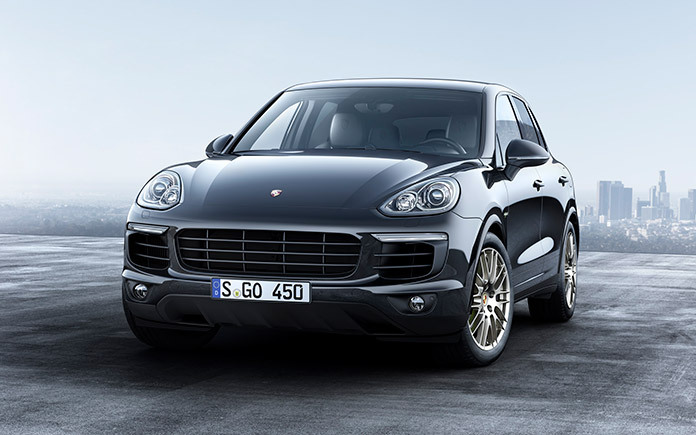 Porsche is offering a new Cayenne Platinum Edition. The special edition Cayenne Diesel and Cayenne S E-Hybrid are easily recognisable at first glance by their distinctive sporty appearance. Both models also offer premium-quality features at a very attractive price. For example, the vehicles’ large 20-inch wheels in RS Spyder design are housed in wider wheel arches. The exclusive interior is dominated by leather sport seats with electric eight-way adjustment, Alcantara centre panels and the Porsche crest on all head rests. Porsche uses the Platinum Edition designation for selected model series that are offered for only a limited time. The models’ expanded features improve comfort and safety in particular. For example, standard equipment in the Cayenne Platinum Edition includes Bi-xenon headlights with the Porsche Dynamic Light System (PDLS), Power Steering Plus and ParkAssist in the front and back come also standard. The latter system not only uses an audible beep to indicate the distance to objects or other cars in front of and behind the vehicle; it also graphically depicts the direct surroundings on the central display. The exterior mirrors and rear-view mirror are equipped with an automatic anti-glare feature as standard, while dark-tinted privacy glass (also standard) provides additional privacy for rear passengers. 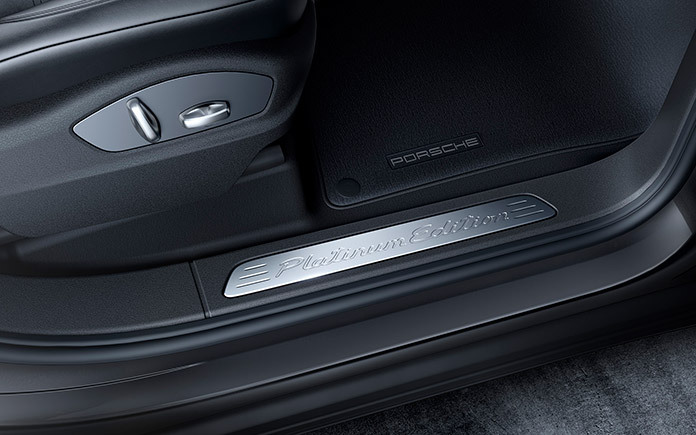 For anyone entering the vehicles, the special status of the Cayenne is plain to see with stainless steel door sills with “Platinum Edition” lettering, and illuminated door sills that light up the model name in the Cayenne S E-Hybrid Platinum Edition. As an additional high-end standard feature, the Platinum Edition models come with the latest generation Porsche Communication Management system that includes online navigation, the Connect Plus module and a BOSE Surround Sound system. The dashboard is adorned with a beautifully designed analogue clock, and the Cayenne S E-Hybrid also comes with a stationary heating/air conditioning system. The three-litre V6 engine in the Cayenne Diesel Platinum Edition has an output of 193 kW (262 hp) and consumes between 6.8 and 6.6 litres of diesel per 100 kilometres in the NEDC, depending on the tyres the vehicle is equipped with. 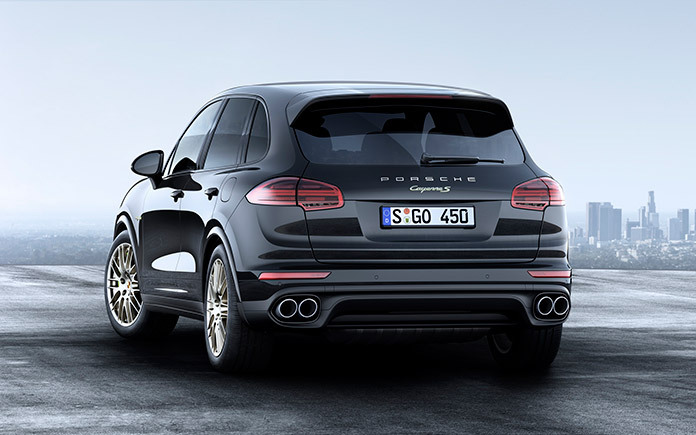 The combined output of the Cayenne S E-Hybrid is 306 kW (416 hp). Here, the perfect interplay between the three-litre V6 petrol engine and the electric motor results in total consumption of 3.4–3.3 l/100 km. The Cayenne Diesel Platinum Edition sells for €74,352, while the Cayenne S E-Hybrid Platinum Edition has a sticker price of €90,298 (all prices include VAT). The Platinum Edition models can already be ordered; the market launch is scheduled to begin in June.